Image: Target. Design: Ashley Britton/SheKnows. Ah, Target. We love you so. Target is one of those places you drive past and think, “I’ll just run in and grab a gallon of milk and some diapers,” and two hours later, you emerge, cart filled to the brim, not a carton of milk or bag of diapers in sight. It’s so easy to make a trip to Target an outing, a treat for Mom, and of course Target has some of the best kids stuff out there. Did you know there are actual psychological reasons behind parents’ obsession with Target? Plus, it’s all in one: grocery store, home decor, nontoxic beauty products, clothes, shoes, school supplies — you name it. Target’s got it. Anybody else black out when they go in there? And whether you have kids or not, their kids section is on point — half the time, we want what’s displayed for ourselves, not our kids. Do you want to check out the best kids stuff but are afraid to go into a Target without blinders on and a only $20 cash in hand? Don’t worry about it. 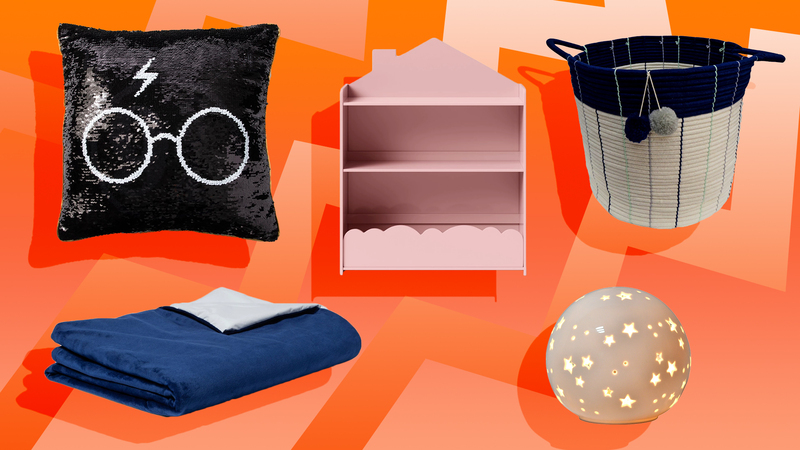 We’ve gathered up the best kids stuff to buy at Target now so you can get in and get out without wandering the whole store. These are the highlights so you can at least go in with a mission. We’ve got your back. This circle shelf offers some sophistication to your kid’s room with the added benefit of offering storage to get some of their crap off the floor. Ever stepped on a Lego with bare feet? Then you understand the necessity of clear floors. Swap out your boring bookshelf with this house bookshelf for a whimsical storage solution that can easily double as a dollhouse for your imaginative tot. It comes in mint, gray, pink or navy, so there’s no chance of clashing with their room decor. This adorable security blanket is sure to soothe and comfort any baby with it’s soft pom-pom corners and bohemian leaf print. It’s small enough to tag along on any adventure, and the oversize pom-poms are easy gripping for chubby baby fingers. Weighted blankets can be so beneficial for kids; they help insomnia, anxiety, sensory issues, stress and more — but usually cost an arm and a leg. Once again, Target delivers on their “expect more, pay less” motto and gives us this amazing soft weighted blanket in myriad colors. When you have kids, there is never enough storage. Fortunately, you don’t have to sacrifice style for function. This large basket offers some serious toy storage capabilities — and is cute to boot with its navy, mint and gray details. Plus, pom-poms. Can’t go wrong with pom-poms. 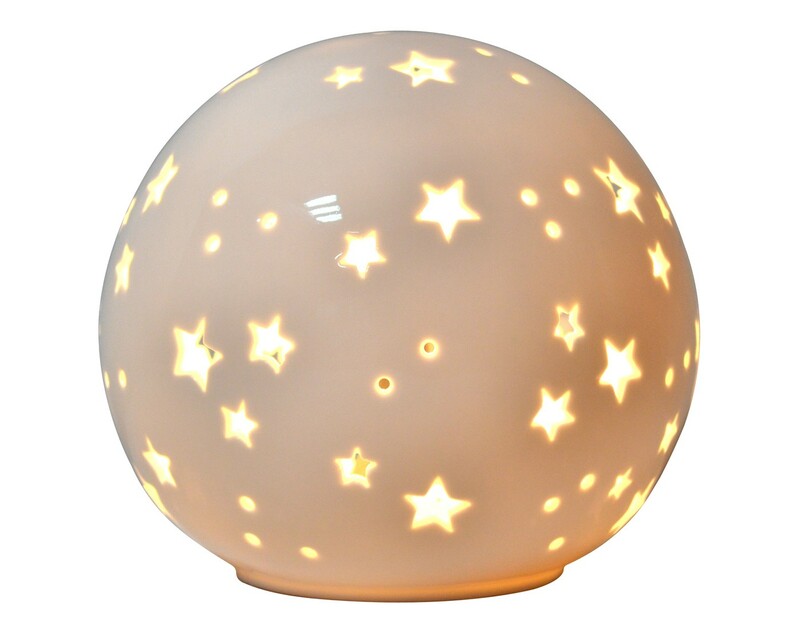 Nighttime is often a struggle for some kids, but with this starry globe night-light, bedtime won’t seem so scary. This is the perfect little night-light to keep monsters at bay. Legit cute blackout curtains. Didn’t think it was possible, did you? Well, think again, because these curtains block out the light and have darling rainbow tassel detailing. Because who said blackout curtains had to be atrocious-looking? Gorgeous, super-soft and luxurious-feeling for a really reasonable price tag, this faux-fur rug is sure to be a favorite spot for your tyke to sit and play. Or nap. Up to them. Whoever invented peel-and-stick wallpaper is a genius and should be celebrated by renters around the globe. This mint triangular wallpaper pattern would be so sweet in a nursery or kids room, lining drawers or the inside of bookshelves for an unexpected pop of color. OK, technically these are for food storage, but we think these make excellent toy storage; each bin is color-coded and see-through, so your kids can see what toys are in each bin, and the varying sizes mean there’s a size for everything. Super-cute and cuddly Plush Pal mat is the ultimate place for lounging or even brought to school as a nap mat for the younger kiddos. It comes in an orange fox, gray bear, white unicorn, white panda or a black-and-white-striped zebra. This round activity table with stools is visually appealing to adults and kids alike. With its natural wood tops and hairpin legs, it’s perfect height for toddlers and kids, and has three metal cups for craft storage in the center of the table to keep pencils, crayons and paintbrushes within reach of little hands. This play mat does double duty as a cute little rug and an activity mat with colorful graphics and a winding road, ideal for your little one’s toy cars. The mat has a latex backing, so it doesn’t slip or slide, and has no pile, so it’s easy for tiny trucks to have big adventures. Toddlers have accidents, and if you’re in the throes of potty training, they can happen any time, anywhere. Save your sanity with this waterproof sleep-anywhere pad that you simply place on top of their sheets so you don’t have to remake the bed every time and pop in the washer when it gets dirty. You might want to get a few of these; you can keep one in your car for quick changes in the trunk (we’ve all been there), and when you’re traveling, this is a lifesaver, as there’s no fitted waterproof sheet to wrestle with and worry the bed won’t be the right size if you’re going on vacation or somewhere unfamiliar. These reverse-sequin items are all the rage, and this one holds a particular soft spot in our hearts, as it will for any Harry Potter fan. When the sequins are brushed one way, it reveals Harry’s glasses and iconic lightning bolt scar. When it’s brushed the other way, the words “Platform 9 3/4” appear. With its gold trim and contrasting colors, it’s a fun, interactive piece of decor that is sure to be a hit with any Potterhead. Tepees offer the perfect hideaway for your little one and offer sanctuary as a reading nook or maybe just a safe space from the torment of an older sibling. These tepees come in so many different colors and patterns and are perfectly priced to make them a must-have for your kiddo’s room.